Industrial Quarter Turn Actuators with Three Phase Motors — Our standard P2 through P13 Series quarter turn actuators are available for 3 phase applications, such as those discussed in our Industrial Three Phase Actuators reference article. Available as a turnkey solution with its own Motor Control Center (MCC) or without the MCC for installations with existing phase monitoring and switchgear. Available in 230, 380, 440, 480, and 575* three phase power selections. *575 is not available for all products. Motor Control Center (MCC) — Motor Control Center equipped three phase actuators offer switchgear, a phase monitor and fault alarm, and integrated local controls and indicators in a NEMA 4 or optional NEMA 4X enclosure. 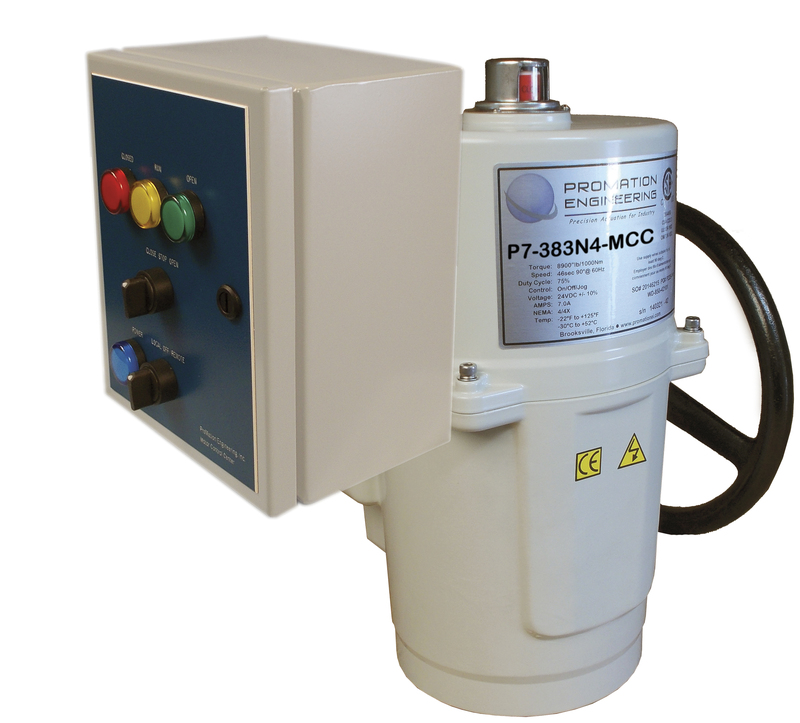 The MCC can be direct mounted or mounted remotely, such as for an actuator in an inaccessible or dangerous location. Actuator Only, 3 Phase (XMCC) — The three phase actuator only option interfaces directly with your existing phase monitoring and switchgear (requires the auxiliary switch kit). Phase monitoring and switchgear necessary for operation is not provided with this option, however, any additional components you may need, such as a control transformer, are available separately. Our Products Fit Your Process — We regularly configure our product to fit specific applications, from prewired actuators and control enclosures for easy installation to remote placement of PCBs for vibration isolation, we specialize in manufacturing engineered solutions for customers, changing our products to create your solution.